The Ultra HD 55UH5C supports Ultra HD content as well as a divided content layout to show up to 4 split images on one screen. Its benefit enables you to create various formats of content to deliver commercial message effectively. Also, it is enhanced in content management. 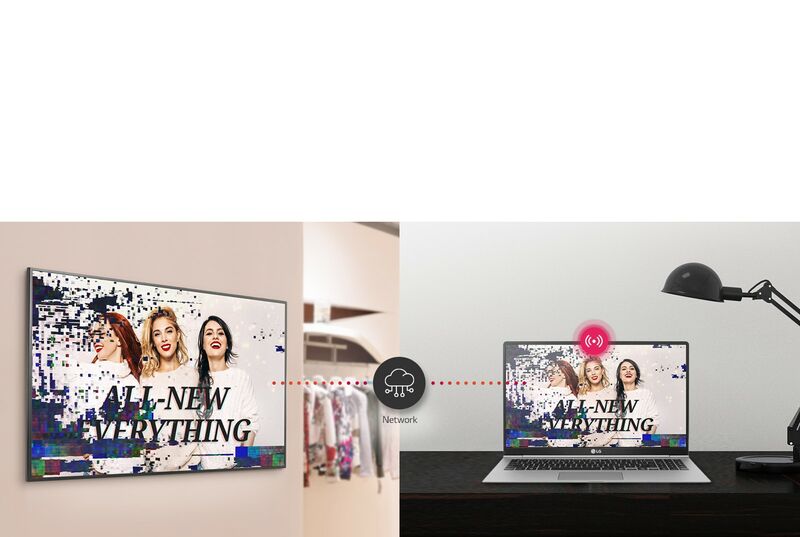 UHD large screen delivers immersive viewing with four times higher definition than FHD. UH5C ensures stable UHD video playback with HEVC (High Efficiency Video Coding) and double the data compression ratio of H.264. 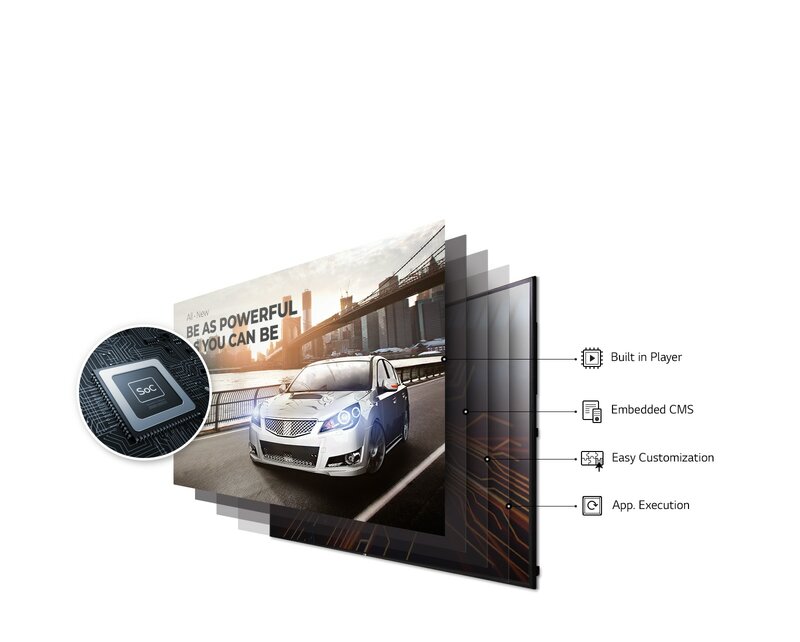 Quad Core SoC (System-on-Chip) executes several tasks at once with smooth content playback without a media player. 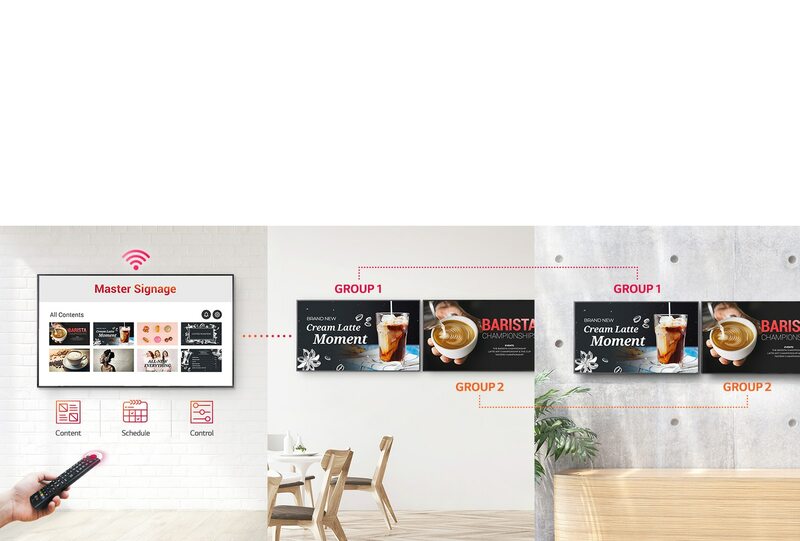 webOS smart signage platform enhances user convenience with intuitive UI and simple development tools. There is no need for additional server or media player connections as UH5C supports USB playback and scheduling. Users can set a playlist and timing for playing content using a USB. 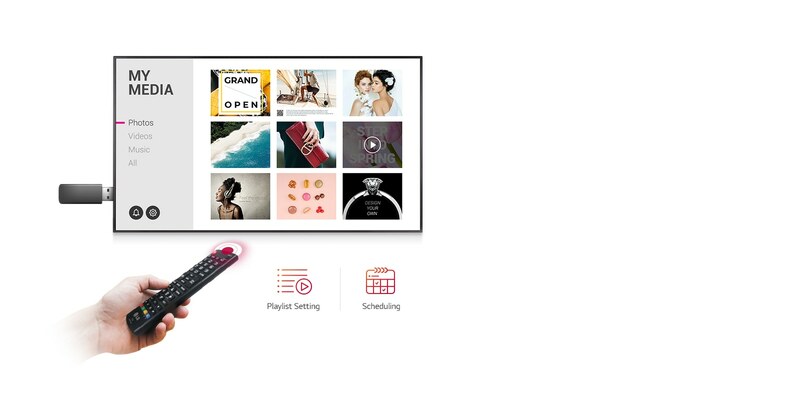 PBP (Picture-By-Picture) and PIP (Picture-In-Picture) enables up to two divided split screens in landscape or portrait display format enabling users to more flexibly allocate space for each content source. Mirroring among devices is more convenient on a Wi-Fi network. 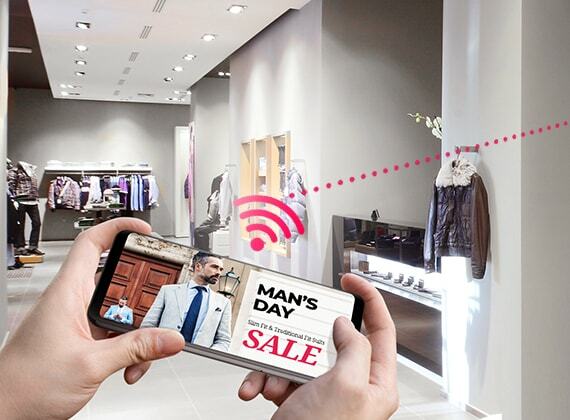 With Beacon and Bluetooth Low Energy (BLE), retail stores can provide coupons and information in real-time. In case of malfunctions or errors, real-time remote care is available. When an alarm occurs, an e-mail notification is sent using SuperSign SW or SI SW via the SNMP Protocol. 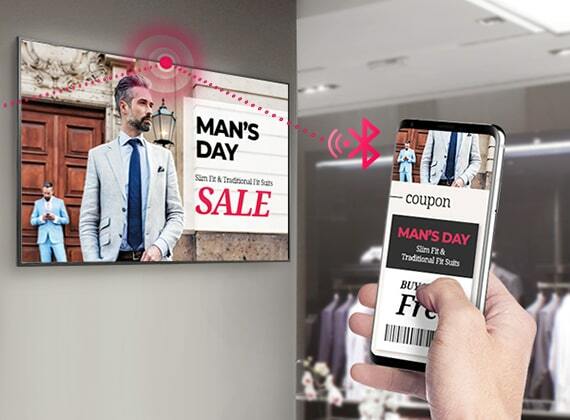 The LG group manager allows users to distribute content and set data on a selected group within the same network without the need for a separate PC or a server. 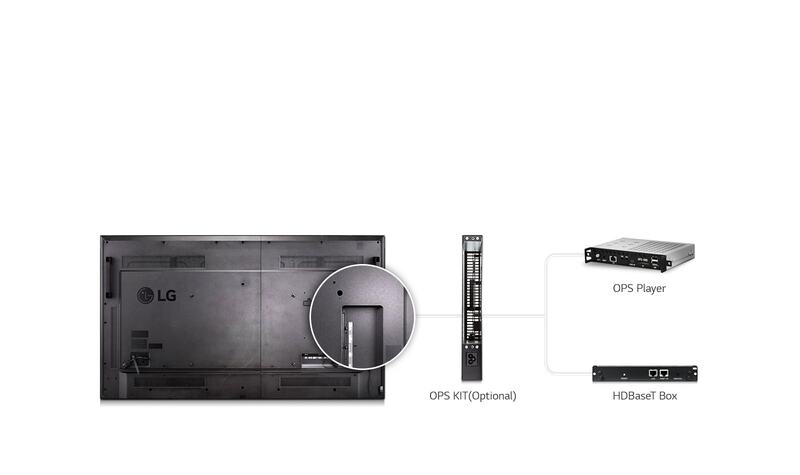 UH5C provides an optional OPS (Open Pluggable Specification) Kit to connect a third-party OPS player or HDBaseT box. Users have the flexibility to choose any media player as long as it complies with the OPS. Before filing a Return Merchandise Authorization (RMA), please make sure to read through our Return Policy. Once we receive the RMA Forms, please wait patiently for further instructions on how and where to send your merchandise. A Return Merchandise Authorization or RMA must be requested within 30 days from the date your merchandise was shipped from our warehouse, any other returns/exchanges past the 30 day policy will not be granted. The package to be returned must be received in our warehouse within 10 business days of the RMA issue date. If you encounter problems with your order and already past the 30-day return policy, please contact the manufacturer directly (see Tech Support for manufacturer phone number and contact information). All returns must be packed in the original manufacturer's box. Please note: Any item returned for any reason other than it being non-working will be subject to a non-negotiable 20% restocking fee plus shipping charges. Your return will be inspected by the Service Department upon receipt. The restocking fee is assessed based upon the condition of the item(s) and determined also by the Service Department. The only exception to this rule is if the item is non-working, and we were contacted within 30 days of the item being shipped. Also note: Once we receive the package, you will receive an e-mail acknowledging receipt and letting you know how long it will take to process the exchange. Please allow 5-7 business days for inspection once your package arrives. NO RETURNS WILL BE MADE FOR DEFECTIVE ITEMS UNLESS YOU HAVE A CASE NUMBER PRESENT. If your merchandise is defective, please contact the manufacturer and explain the problem in detail (see Tech Support for a list of manufacturer phone numbers). You will be asked to troubleshoot your item, and then a “case number” will be created. Please make sure to take note of this number. If your problem has not been resolved through the troubleshooting process, place an RMA request and provide the case number. Please be advised: If you receive any parts or a replacement from the manufacturer, your returns process with Enter Computers will be complete and closed. Defective Returns without any case number are subject for 20% Restocking fee plus freight charges. Case number has to show that a trouble shoot attempt has been documented and it’s not just a number. Enter Computers will verify serial numbers and claimed defects prior to shipment of replacement unit or credit. Item(s) not found to be defective will deduct a charge of $75.00/hr minimum of 1 hour labor from your credit. Missing or damaged items due to via shipping will be replaced or exchanged only. Open box items are not eligible for return unless otherwise specified. What happens If I Refuse My Order? If your order has been shipped and refused for any reason, there will be a non-negotiable 20% restocking fee plus shipping charges. Enter Computers is a leading IT provider of technology solutions including hardware products, software, services and consulting in most industries including small, medium, enterprise and public sector organizations throughout the US and Canada and beyond. © 2018 Enter Computers. All Rights Reserved.